The latest incarnation of the Dodge Challenger Hellcat comes in the form of the Redeye. The vehicle takes many of its influences from the Demon, but has 797HP instead of 840 HP. 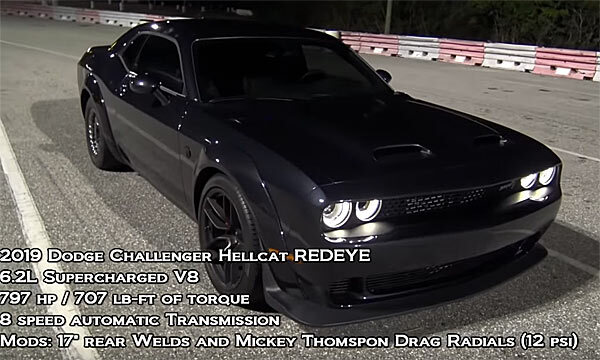 This drag race video throws a Dodge Redeye down the dragstrip, measuring exactly what this beast can actually do. The car is mostly stock with its 6.2 L V8 engine, 2.7L supercharger( the same as in the Demon), eight speed automatic transmission, with mods coming in the form of 17 inch rear welds and Mickey Thompson drag radials at 12psi. The Redeye was given three passes to prove its worth, coming out with a best time of 1.47 sec. 60 foot, 10.57 secs. quarter mile and 127 – 128 mph. In comparison the Challenger Demon can hit 9.9-10 secs. at 135-137 mph.